Identification: Complete lateral line, silver peritoneum.Check for rosy red color in mutants sold as bait ()Hubbs et al 2004). Native Range: Mississippi River basin from western Pennsylvania to Minnesota, and south to Gulf; Gulf Slope drainages from Mobile Bay, Georgia and Alabama, to Rio Grande, Texas, New Mexico, and Mexico. Populations in Rio Grande of New Mexico and western Texas may have been introduced (Page and Burr 1991). Table 1. States with nonindigenous occurrences, the earliest and latest observations in each state, and the tally and names of HUCs with observations†. Names and dates are hyperlinked to their relevant specimen records. The list of references for all nonindigenous occurrences of Pimephales vigilax are found here. Means of Introduction: Hubbs and Black (1947) noted that the one known locality record for this species in the Osage River system of Kansas, was based on material taken from Jones Pond, Coffee County, and "no doubt represents an introduction from the Neosho River system." This species apparently was introduced into the Kansas River system of eastern Kansas before 1976 (Cross and Haslouer 1984). It was first recorded in the Missouri River in Missouri in 1994, apparently the result of dispersal of populations introduced into the Kansas River system of Kansas (Pflieger 1997). It is uncertain if the records from the Missouri River drainage in Nebraska and South Dakota (and also Iowa) are valid, and, if valid, if they represent introductions (see discussion in Remarks section). Hubbs and Black (1947) stated that the single record (under the name Ceratichthys perspicuus) from Lake St. Marys (Great Lakes drainage) in Ohio should be considered valid. These researchers also mentioned that M. B. Trautman suspected it of being a bait introduction. Maintaining that same position years later, Trautman (1981) stated that the Lake St. Marys record "probably was an escape from the minnow bucket of a fisherman." He also remarked that by 1945 it was of common occurrence in the tanks of commercial bait dealers in Ohio. In their summary table on fishes of the Great Lakes basin, Bailey and Smith (1981) indicated that Pimephales vigilax perspicuus had colonized tributaries of Lake Erie recently via canal or by natural dispersal following introduction. Sublette et al. (1990) stated that it was introduced to the Rio Grande drainage of New Mexico during and since the 1970s. The possible method of introduction was not discussed. Similarly, Hubbs et al. (1991) did not provide explanation for its apparent introduction into the Rio Grande and the Red and Canadian river drainages in Texas. Presumably these were by bait-bucket release or stock contaminants. According to Sigler and Miller (1963), Pimephales vigilax vigilax was accidentally introduced into the Sevier River drainage in Utah in 1953 along with several thousand channel catfish received from San Angelo, Texas. Sigler and Sigler (1987) indicated that it was introduced to Utah Lake, Utah, in 1969, but these authors did not provide additional details. The first record of this species in the Fox River, Wisconsin, is based on nine specimens taken in July 1960. Johnson and Becker (1980) and Becker (1983) suspected that the fish entered that drainage from the Mississippi River basin via the old Fox-Wisconsin Canal at Portage, also known as the Portage Canal. The Menomonee River record is based on a report from the early 1900s. Greene (1935, cited by Becker 1983) suggested that the record may have been based on a bait bucket release, or a recent immigrant via highwater connections between the Rock and Milwaukee river systems. Status: Established in Kansas, New Mexico and Texas; possibly established in western Missouri; reported from Nebraska, South Dakota, Utah, and Wisconsin. Sigler and Miller (1963) were uncertain if the fish became established in the Servier River drainage of Utah. In reference to the Utah Lake introduction, Sigler and Sigler (1987) noted that it may be reproducing in small inlet streams but its presence had not been reported recently. In their Appendix on Utah fishes, Sigler and Sigler (1996) noted that the species is no longer found in Utah. Remarks: Hubbs and Black (1947) revised group and recognized two closely related forms as separate species Ceratichthys vigilax and Ceratichthys perspicuus. The two are now considered a single species under the name Pimephales vigilax (Lee et al. 1980 et seq. ); however, some authors (e.g., Trautman 1981; Becker 1983) have treated them as subspecies (i.e., Pimephales vigilax vigilax and Pimephales vigilax perspicuus). The literature is unclear and somewhat contradictory concerning the native versus nonindigenous distribution of this species. Lee et al. (1980 et seq.) stated that the Upper Rio Grande and northern Texas (Red River drainage) populations were presumably introduced. The dot distribution maps given by Hubbs and Black (1947; as Ceratichthys perspicuus) and Lee et al. (1980 et seq.) also show records from the Missouri River and tributaries (e.g., lower James River) within the states of Nebraska, South Dakota, and Iowa. However, these researchers apparently considered the Missouri River records to represent part of its native distribution. In contrast, Cross et al. (1986) stated that Pimephales vigilax "did not occur naturally in the Missouri River system." In their summary table, Cross et al. listed it as introduced to the Kansas River and Sioux-James River systems and as native to the Red River and elsewhere. Page and Burr (1991) stated that populations in the Rio Grande of New Mexico and western Texas may be introduced. They did not mention the possibility of its introduction into other areas. Furthermore, in their range map for this species, Page and Burr (1991) did not show it as occurring in the Missouri River drainage. Similar to Lee et al. (1980 et seq. ), Hubbs et al. (1991) stated that "populations apparently introduced into the upper Rio Grande Basin and upper Red and Canadian basins in Texas." Smith and Miller (1986) recognized it as native to the lower Rio Grande and Pecos river drainages. They made no mention of its possible introduction into the upper Rio Grande. 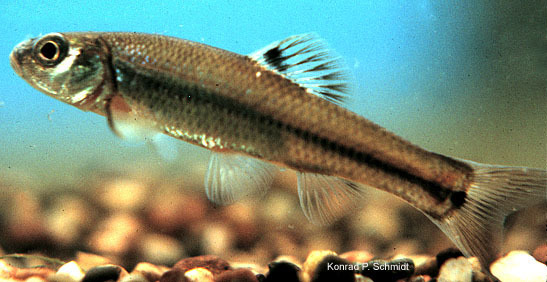 Cross and Collins (1995) noted that the Bullhead Minnow has become common in the Kansas River in Kansas as far west as Saline County. Records from the Missouri River system in South Dakota (and possibly adjacent states) may be erroneous. For example, without providing details, Hubbs and Black (1947) had doubts about records from South Dakota. Apparently in reference to all, or many, of these same South Dakota records, Bailey and Allum (1962) made note of Pimephales notatus specimens that had been misidentified as "Ceratichthys vigilax" in the earlier literature. Unfortunately, they made no further mention of "vigilax" in their work. (Bailey and Allum also stated that P. notatus was one of a group of species that had become established in the upper Missouri through introduction; however, they also speculated on natural events to explain observed fish distributions.) Trautman (1981) found Pimephales vigilax in bait pails of anglers at Buckeye Lake, Ohio, and later captured a specimen in the lake. However, he added "Despite the recent increase in abundance and unintentional introductions into many sections by bait fishermen there appears to have been no notable recent extension of its range in Ohio." Trautman did note that the specimen taken in 1927 from Lake St. Mary constituted the only known Lake Erie drainage record for Ohio. According to Becker (1983) noted that no voucher specimens are known to substantiate the Menomonee River record (Wisconsin). In apparent conflict with Page and Burr (1991), Underhill (1986) listed this species as native to tributaries of Lake Michigan. Hubbs and Black (1947) noted the taking of a single specimen of "Ceratichthys perspicuus" from a pond in the Osage River system in Kansas. In addition, they reported the finding of at least one specimen of "Ceratichthys tenellus" (now recognized as the slim minnow Pimephales tenellus) from the same station and stated that it also doubtless represented an introduction from the Neosho River system. Hocutt, C.H. and E.O. Wiley. 1986. The Zoogeography of North American Freshwater Fishes. Hubbs, C.L. and K.F. Lagler. 2004. Fishes of the Great Lakes region. Revised Edition. University of Michigan, Ann Arbor, MI.